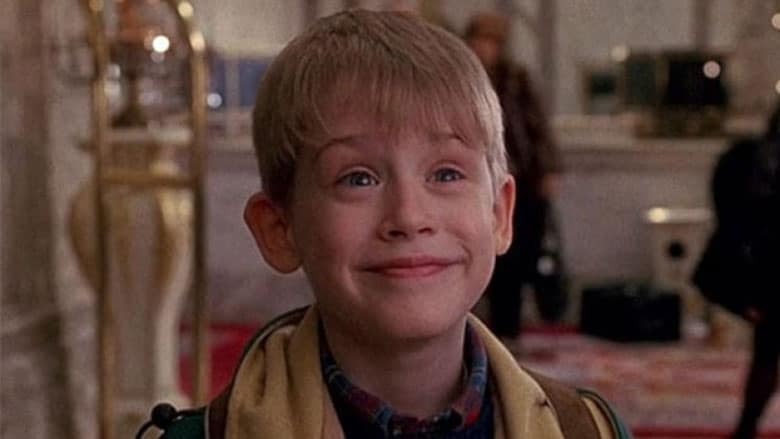 Where to Watch Home Alone in 2019 (Updated!) | Nerd Much? The eggnog lattes in red decorative cups have been spotted, and that officially means Christmas is coming. Every year, we here at Nerd Much? compile a mega guide to all of the Christmas movies on TV for that given year, taking all of the information from various networks and streaming giants and organizing it into an easily digestible post. And while doing so this year, one thing that we noticed is that a holiday favorite, Home Alone, isn’t scheduled to be shown on any broadcast or standard cable channels. This is a bit of an oddity, as it usually makes an appearance on the holiday TV schedule, alongside its sequel. In fact, last year, AMC had the rights to show the movie on its cable network. This year, however, it’s nowhere to be found, unless you are paying extra for the premium channel, STARZ Encore (which is typically an extra $9/month, for those who wanted to look into purchasing it). However, while that’s your only option for watching it on cable television, there are some other options. So, Where Can You Watch Home Alone Right Now? 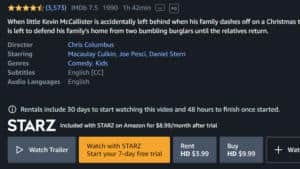 If you haven’t used your 7-Day free trial of the Starz channel through Amazon Prime Video, you can start your free trial, watch Home Alone and Home Alone 2, and then you’re set for the season. You can cancel after you watch, although you might want to check out what else the STARZ channel has to offer before canceling). 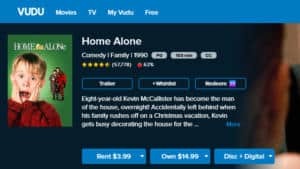 Vudu is a great movie streaming platform that allows you to (legally!) rent or buy a metric buttload of movies rather easily. You can rent Home Alone on Vudu to stream for just $3.99 in HD quality. Or, if you prefer to buy once and keep it forever, you can purchase Home Alone on Vudu for $14.99 so that you’ll have it for every future holiday season as well. You can also rent or buy Home Alone 2: Lost in New York for the same prices, or you can buy them together in a bundle for $23.99. 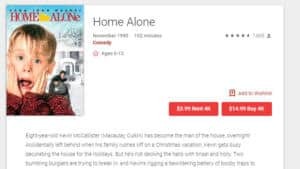 You can also rent or buy Home Alone on Google Play. Renting is $3.99 for 48 hours, or you can purchase it in full 4K streaming quality for unlimited watches at $14.99. The Google Play app works flawlessly for watching on Android phones and tablets, however, it’s a bit wonky on Chromebooks (although, yes, you can get it to work). Starz Encore: Tuesday, Nov. 27 at 7:20 AM & 4:33 PM. Starz Encore Family: Friday, Nov. 30 at 7:06 AM & 8:05 PM.